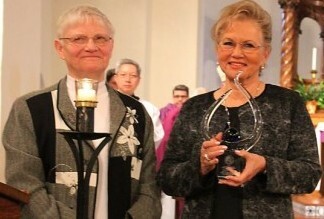 Sister Patricia Suchalski (left), president of the Sisters of the Blessed Sacrament, presents the St. Katharine Drexel National Justice Award to Costa Rican-born Carmen Bermúdez, CEO of Mission Management and Trust Co. in Tucson, Ariz., for her assistance to minorities and women. The official feast day for St. Katharine Drexel — the foundress of the Sisters of the Blessed Sacrament who devoted her life to the evangelization and advancement of Black and Native American people — is March 3, the anniversary of her 1955 death and entrance into heaven. 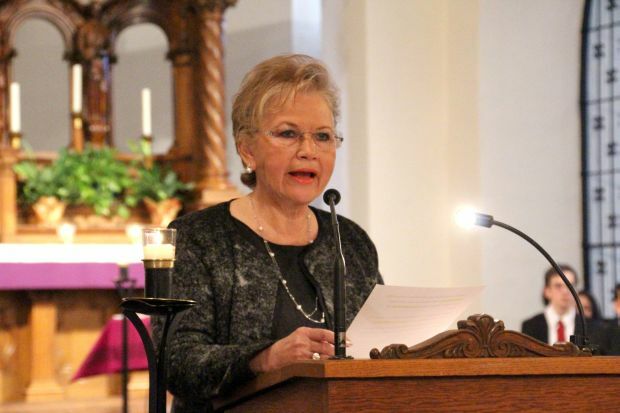 Although her congregation celebrates that day among themselves, a more public observation is held annually at their Bensalem Motherhouse generally on the following Sunday. 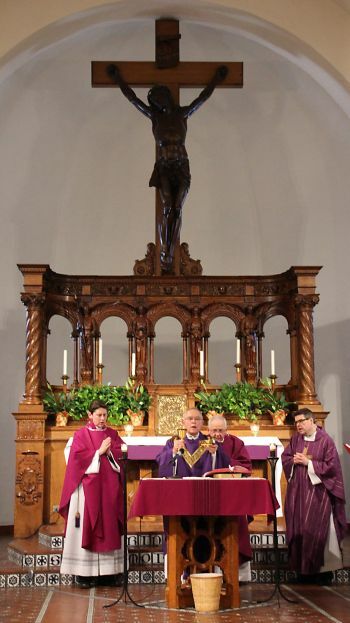 This year it was on March 8, and Archbishop Charles Chaput visited the convent to join the sisters and the public in honoring Philadelphia’s first and only native-born saint. 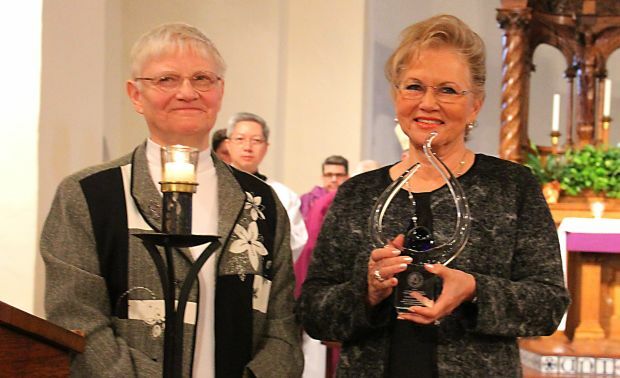 In recent years the sisters have also used this event as a day to present their annual St. Katharine Drexel National Justice Award to an individual who reflects the values fostered by St. Katharine. By coincidence not design, March 8 also happens to be International Women’s Day and this year’s honoree, businesswoman Carmen Bermudez of Tucson, Arizona, joins such previous female recipients of the award as Regina Benjamin, former surgeon general of the U.S.; Sister Kateri Mitchell, S.S.S., the first Native American executive director of the Tekakwitha Conference; Sister Sandra Smithson, O.S.F., founder of Project Reflect and promoter of education and policy reform; and Sister Mary Scullion, R.S.M., co-founder of Project HOME. Bermudez, a member of St. Thomas Parish in Tucson, is the founder and CEO of Mission Management and Trust, which was established in 1994 to assist companies, religious groups and other nonprofits in the management of their assets. Coincidentally it also devotes a good portion of its own profits to community causes especially through assisting women and minorities to rise above the challenging circumstances of their lives. Bermudez’s own life is a colorful and remarkable example of rising above poverty and achieving the American dream. She was born in San Jose, Costa Rica, the third of four children, but her father left the family when she was 2, leaving them in dire poverty. When she was 7, she told her mother that someday she would not be poor. Her mother laughed and asked how this would happen. “I’ll be a bullfighter,” little Carmen said. Her mother laughed and pointed to a field where some cows were grazing, telling her to practice there. Archbishop Charles Chaput (center) celebrates Mass at the Blessed Sacrament Sisters’ motherhouse on Sunday, March 8, with concelebrants (from left) Father Richard McFadden of St. Charles Parish in Bensalem, Franciscan Father Fidelis Weber and Father Joseph McCaffrey, school minister at Little Flower High School. Carmen went into the field and soon found there was also a bull there. He lowered his horns and she ran for her life. But even at that age, she experienced an adrenalin rush she had never known and the memory stayed with her. She was 15 in the late 1950s when an aunt in California sponsored her mother and herself for immigration and a new life. She attended Santa Monica High School while working to help her mother sponsor her siblings, and briefly attended Santa Monica College, but left to assist the family. She never forgot her childhood love for bullfighting. She took lessons from a friendly professional who did not charge her, and she did become a professional bullfighter with moderate success with bulls and calves, first in Costa Rica and then in Mexico. One difference: Costa Rica is a country where the bull is not killed; Mexico followed the Spanish tradition requiring the bull to be killed. With that said, bullfighting may be exciting but it is not only the bull that is at risk. Eventually, after several injuries, Bermudez hung up her cape and began a second career as flight attendant for T.W.A. from which she retired in 1987. It was during her travels that she met her future husband, Thomas Feeney, who was CEO of Marathon Asset Management in La Jolla, Calif. After learning the business through him she struck off on her own to found Mission Management and Trust in 1994. Among her very first clients was the Sisters of the Blessed Sacrament. “The sisters liked the idea that it was minority owned and also women,” she explained. Mission Management has prospered to the point where Feeney has merged Marathon Asset Management into it and is now the chief investment officer of the combined company. She has not forgotten where she came from, but “when you get to the top you have to send the elevator down for others,” she said. 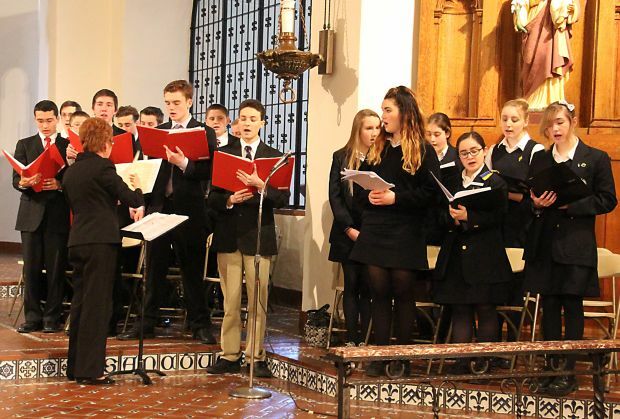 The combined choirs of Holy Ghost Preparatory School and Nazareth Academy, led by Beth Vilsmeier, fill St. Elizabeth’s Chapel with joyous music.